We booked our tickets on December 23rd on LH 3151 from Oslo to Hamburg, travelling on with LH 4486 to Barcelona. The return took us on the LH 4453 to Frankfurt am Main, with the corresponding flight LH 3134 to Oslo. The rating confirms Lufthansa as a good and reliable airline for the traveller, leaving them with with four B's, with a small minus. The biggest potential - the food!! Overall the planes left on time and the boarding went smoothly. The reason why it miss a full score is a 15 minute delay in Frankfurt, where we were left in the airplane, with no information on the delay. We paid all in all around 300 Euros roundtrip, including taxes. 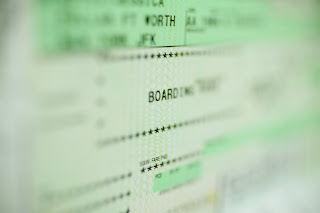 A strong price for the ticket, and the airline experience is worth it. The seats were comfortable on economy class, maybe a little narrow, but with adequate room for the legs. Food: BB+ Meals were included in the price, but if it had not been for the warm lunch served between Hamburg and Barcelona the airline would have been awarded a miserable two B's. On the flights from Oslo to Hamburg, and back from Barcelona to Frankfurt, we were served sandwiches with either cheese or beef/turkey. I chose sandwiches with cheese on two flights. They were very dry and uninteresting. A leaf of lettuce or even a slice of tomato, would have provided a more moist experience and left a better impression of the food. As I chose the sandwich with turkey to Oslo, I found it slightly better, due to the moist provided by the sliced turkey, but the bread was as dry as ever. The warm meal served from Hamburg to Barcelona was much more delicious. Bulgur wheat with pesto and a mediterranean vegetable stew - deserves BBBB. But all in all, the biggest potential Lufthansa has on its european destinations is the food, at least when they serve sandwiches. Lufthansa is still a reliable and good airline and it deserves its score. The biggest potential to become an even better airline is definetely the food, if it has the overall standard we met on the trip. But still - a good airline experience! !